Four billion miles from Earth, the New Horizons probe that recently sent such lovely pictures of Pluto is drawing near to the most distant object mankind has ever come close to: Ultima Thule, a mysterious rock deep in the Kuiper belt. The historic rendezvous takes place early tomorrow morning. This is an encounter nearly 30 years in the making, if you count back to the mission’s beginnings in 1989, but it’s also been some 13 years since launch — the timing and nature of which was calculated to give the probe this opportunity after it had completed its primary mission. New Horizons arrived at Pluto in the summer of 2015, and in its fleeting passage took thousands of photos and readings that scientists are still poring over. It taught us many things about the distant dwarf planet, but by the time it took its extraordinary parting shots of Pluto’s atmosphere, the team was already thinking about its next destination. In fact the next destination had been chosen during a search undertaken in concert with the Hubble Space Telescope team back in 2014. Ground-based reconnaissance wasn’t exact enough, and the New Horizons had to convince Hubble’s operators basically to dedicate to their cause two weeks of the satellite’s time on short notice. After an initial rejection and “some high-stakes backroom maneuvering,” as Principal Investigator Alan Stern describes it in his book about the mission, the team made it happen, and Hubble data identified several potential targets. 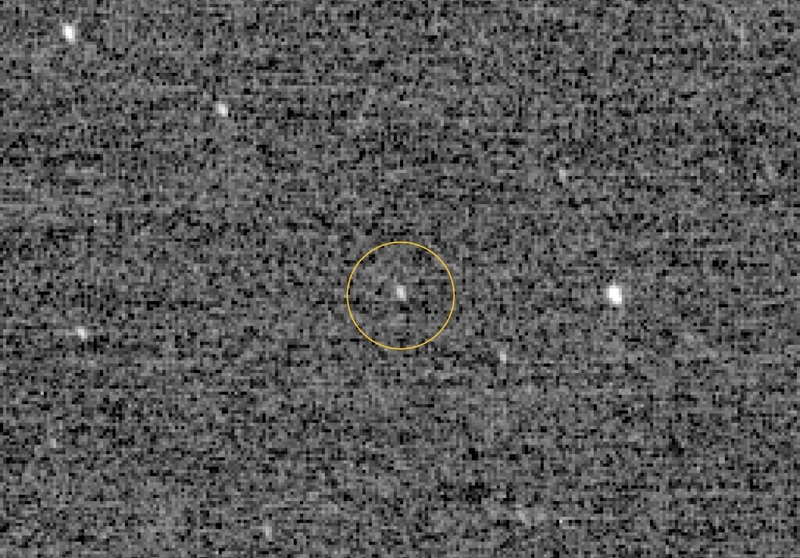 Ultima Thule as first detected by New Horizons’ LORRI imager. 2014 MU69 is a rock of unknown (but probably weird) shape about 20 miles across, floating in the belt about a billion miles from Pluto. But soon it would be known by another name. At the time, he and the team had just gotten visual confirmation of the target, though nothing more than a twinkle in the distance. He was leaving immediately after our talk to go run flyby simulations with the team. The Voyagers are the farthest human-made objects, sure, but they’ve been flying through empty space for decades. 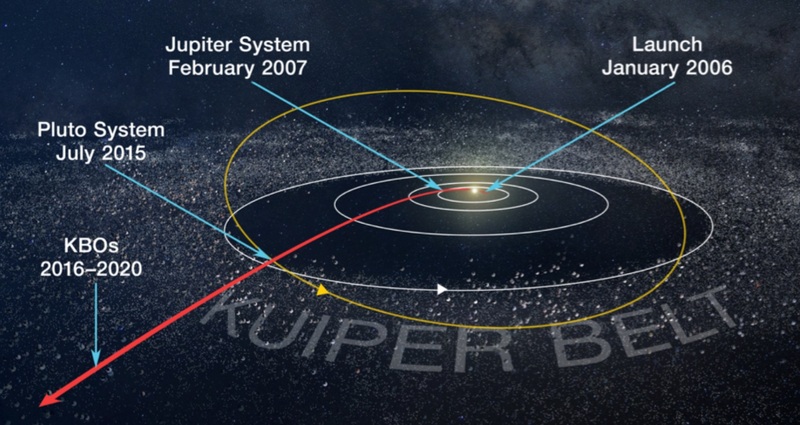 New Horizons is out here meeting strange objects in an asteroid belt. Good luck putting together another mission like that in less than a few decades. In the time I’ve taken to write this post, New Horizons has gone from almost exactly 600,000 kilometers away from Ultima Thule to less than 538,000 (and by this you shall know my velocity) — so it’ll be there quite soon. Just about 10 hours out, making it very early morning Eastern time on New Year’s Day. Even then, however, that’s just when New Horizons will actually encounter the object — we won’t know until the signal it sends at the speed of light arrives here on Earth 12 hours later. Pluto is far! The first data back will confirm the telemetry and basic success of the flyby. It will also begin sending images back as soon as possible, and while it’s possible that we’ll have fabulous pictures of the object by the afternoon, it depends a great deal on how things go during the encounter. At the latest we’ll see some by the next day; media briefings are planned for January 2 and 3 for this purpose. Once those images start flowing in, though, they may be even better in a way than those we got of Pluto. If all goes well, they’ll be capturing photos at a resolution of 35 meters per pixel, more than twice as good as the 70-80 m/px we got of Pluto. Note that these will only come later, after some basic shots confirming the flyby went as planned and allowing the team to better sort through the raw data coming in. NASA public relations and other staff are still affected by the federal shutdown, but the New Horizons team will be covering the signal acquisition and first data live anyway; follow the mission on Twitter or check in to the NASA Live stream tomorrow morning at 7 AM Pacific time for the whole program. The schedule and lots of links can be found here.